Even as EBRP sues JBE’s Auction Board appointee Jacob Brown for $29,000 in unpaid sales taxes, his Auction Board Chairman and fellow Amite, Louisiana resident, Jacob Warren, continues Board’s longstanding pattern of thumbing its nose at auction victim Judy Fasola. Our recent post on the arrest of Gov. John Bel “Honor Code” Edwards’ Louisiana Auctioneer Licensing Board (LALB) appointee, Jacob Brown, is proving to be one of our most popular features judging by Facebook shares (119 at the time of this writing), so we’re going to stay committed to keeping subscribers abreast of developments on Brown’s criminal charges, especially since WAFB, in its feature on Brown’s arrest for issuing $175,000 in worthless checks, failed to even mention that Brown is one of Gov. Edwards’ LALB appointees (though he was VERY quietly removed leading up to his arrest). In keeping our subscribers up to date on developments, we have submitted a public records request to Louisiana State Police (LSP) for a copy of Brown’s arrest warrant. LSP has responded indicating that “we estimate the time to fulfill your request is 30 days.” It’s our understanding that many LSP Troopers are presently cruising in international waters for the Louisiana State Trooper Association’s annual convention, so perhaps such a lengthy expected period to fulfill a request for a single document is understandable. That argument is no doubt correct, as examples abound of auctioneers stiffing sales tax authorities in EBRP. For example, Barbara Bonnette, another former LALB member based in Alexandria, Louisiana, was also accused of stiffing EBRP tax authorities on two auctions she conducted in 2007. Of course, even if Brown had the sales tax bond (trust us, he didn’t, and the LALB “let him slide” as they do so much other corruption throughout the state), $5,000 would have only covered 16% of what he has allegedly stiffed EBRP taxing authorities on. Now, perhaps nobody was more infuriated at Brown’s arrest than a lady named Judy Fasola. She was fleeced in 2013 by notoriously-problematic auctioneer Ken Buhler. For those subscribers unfamiliar with Buhler, his auction license was revoked in 2006 when he stiffed an ungodly number of bidders and consignors alike, including an elderly lady named Ms. Linda Williams, who appeared before the LALB when Buhler sought to have his license reinstated in late 2010. Sound Off Louisiana founder Robert Burns, who was a relatively new LALB member appointed in Jindal’s first term, made it crystal clear to the Jindal administration that, under NO circumstances would he vote to reinstate Buhler’s license (then-LALB member Rev. Freddie Lee Phillips joined Burns in his opposition to Buhler). Burns had made it clear that the LALB was acting irresponsibly in renewing Buhler’s license, particularly in light of the fact that, even at the time of his requested renewal, he was facing a civil trial which was pending in the Middle District of Louisiana entailing the fraudulent use of interstate commerce instrumentalities. A mere nine months later, Buhler was hit with approximately $200,000 in civil judgments by the Federal court once a jury found him liable of the fraudulent use of such instrumentalities. We wish those who obtained the judgments the best of luck in collecting! Well, as the old saying goes, “a leopard doesn’t change its spots,” and Buhler was up to his old tricks once again. Folks, if you’ve never watched a single video Sound Off Louisiana has published, we strongly encourage you to watch the video below of Buhler victim, Judy Fasola, as she vents her frustration at the LALB. The LALB, despite having fined Buhler’s company, Estate Auction Services, $1,000 for Buhler’s handling of Fasola’s auctions (they were to be a series of Friday night auctions until Fasola claims she discovered Buhler was simply selling her items, potentially not even at auction, to family and friends at bargain-basement prices), was adamant that it would not file a bond claim on Fasola’s behalf. That’s the case despite the LALB having told her that it WOULD file a bond claim on her behalf! Fasola vents frustration with LALB over its steadfast refusal to file a bond claim on her behalf entailing an auction by Ken Buhler. 1. LALB letter to Brant Thompson saying investigation closed with no auctioneer wrongdoing. 2. Thompson’s VERY terse two-page response (note Thompson was smart enough to Cc Gov. Bobby Jindal’s then Head of Boards and Commissions, Holly Robinson). 3. One-minute video of Thompson appearing before the LALB and them providing him the greased rail he wanted to file a bond claim and them even going so far as to treat him like royalty and indicating just how happy they’ll be to file a bond of up to $10,000 for his losses. The above video speaks for itself, so we’re going to add no commentary to it other than to reference the links beneath it to support Fasola’s claims of favoritism to Thompson. 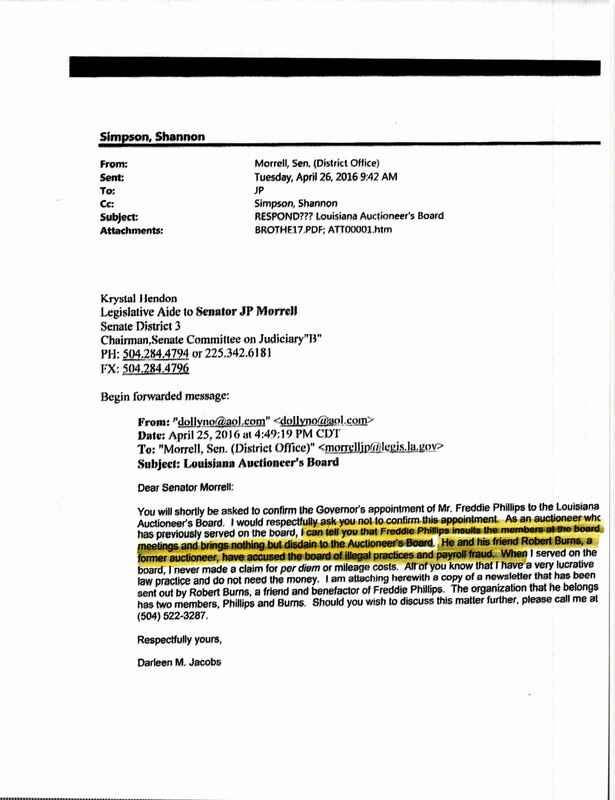 Further, they are so fixated on trying to convince Fasola they didn’t know who Brant Thompson was that they overlook the fact their own investigator said he could find “no evidence that Mr. Thompson consigned anything to this auction whatsoever!” That should have been a major concern for them irrespective of whom Thompson may be related to. Ms. Fasola contacted Sound Off Louisiana very distraught at the arrest of Jacob Brown. It seems that Fasola was under a misguided perception that the “new” LALB under Gov. “Honor Code” would view her situation differently than the LALB depicted on the video above, who were all Jindal appointees. In his letter, Warren states that, because Fasola sued Buhler, they will do nothing until she gets a judgment that can’t be collected. When Fasola visited with her attorney, Mike Davis, he agreed to file the lawsuit (drafted pro se even though Davis made an error and forgot to remove the phrase “appearing through undersigned counsel” in its opening paragraph even though it was filed pro se and called for Fasola’s — not Davis’ — signature at the end) for one purpose and one purpose only: to keep the LALB’s continued foot-dragging on filing a bond claim from causing the prescription period of three years for the LALB to file such a bond claim from expiring! Davis, who drafted the lawsuit as a favor to Fasola for her enthusiastic support of him as he was running for a 19th JDC judgeship at the time, upon losing the race for judgeship, wasted no time sending Fasola a correspondence stating that he “didn’t have the expertise” to proceed forward with the litigation. He then referred her to attorney David Opperman, who has himself been the subject of adverse press of late. Opperman then sent her a correspondence stating that the only condition under which he would accept the case was if Fasola provided an up-front $10,000 retainer. Naturally, that was cost prohibitive since, though she says her losses exceeded the amount of the LALB minimum bond of $10,000, she would accept that to close the book on this sordid mess. Rev. Phillips tells LALB members they should not treat Fasola differently than Thompson. See, folks, the absolute last thing that the LALB wanted was for Rev. Freddie Lee Phillips to be able to sit in on the Board’s Executive Sessions (of which they convene at every single meeting to discuss all the auctioneer wrongdoing going on in Louisiana totally outside of the public eye and devoid of public scrutiny) because he would cause trouble in not going along with covering up such massive wrongdoing. Hence, they lobbied their elected officials to simply either #1) fail to confirm Rev. Phillips (see just one such email by clicking here), or #2) having Gov. Edwards rescind Phillips’ appointment. As our long-time subscribers know, Gov. John Bel “Honor Code” Edwards caved to these massive appeals and rescinded Phillips’ appointment on May 5, 2016, a mere 15 days after he’d made the appointment. Four days later, when “Honor Code” lied through his teeth and said he rescinded the appointment as a result of a “prior commitment,” Phillips confronted him head-on entailing the rescission. Fasola supplied us with a copy of an email she sent to Warren asking for her request to have a bond claim filed by the LALB on her behalf to be placed on the September 10, 2018 agenda. When we publish the next edition of this series, we’ll let everyone know what Warren’s response to Fasola is. So, that will provide just a little history on one of the most corrupt occupational licensing boards in this state, the LALB. Once LSP provides us with a copy of the arrest report of the distinguished “Honor Code” appointee above, Jacob Brown, we’ll provide another installment to this series and we’ll include yet another victim who was screwed, glued, and tattooed by this LALB, 83-year-old widow, Betty Jo Story. In the meantime, anybody feeling like getting all pumped up to go bid at a Louisiana auction? Maybe bold enough to consign merchandise to be sold at auction? If any such person is inclined to do so, surely the top-notch LALB appointees of Gov. John Bel “Honor Code” Edwards, as depicted on full display above, will give any such individual immense confidence and reassurance that, should anything go wrong, that individual can surely count on the upstanding members of the LALB to protect him!